Asparagus and prosciutto is everyone’s springtime favorite, whether as a simply wrapped appetizer or in a more complex pasta dish. 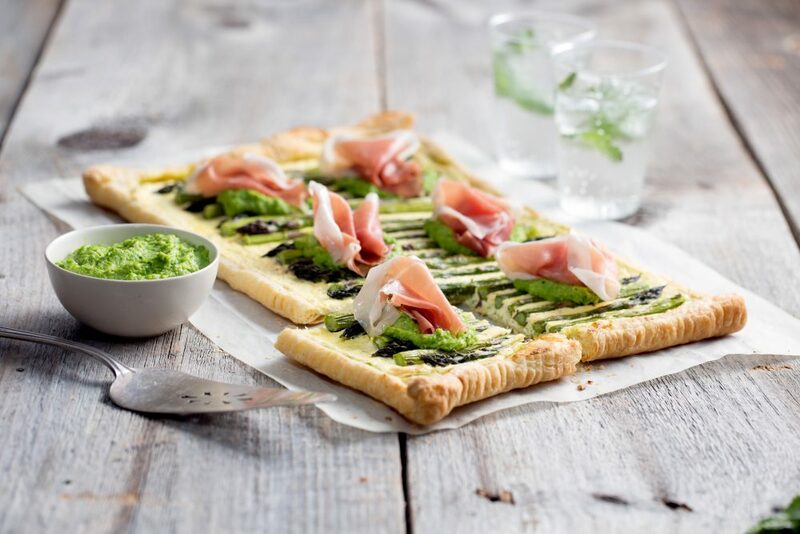 But this Asparagus and Prosciutto di Parma Puff Pastry Tart is anything but ordinary; with a homemade spring pea pesto and ricotta cheese, this dish will quickly become a must-have for friends and family alike. There isn’t anything better than a meal that captures every ounce of flavor from the season, and this tart does just that for spring. Serve as an appetizer or a main dish for every garden party, and be sure to pair a light wheat beer or sparkling wine if you’re feeling festive. In a blender or food processor, puree peas, olive oil, pine nuts, ¼ cup parmesan cheese, mint and garlic until smooth; set aside. Preheat oven to 400°F. On lightly floured surface, roll out puff pastry to 15-inch x 9-inch rectangle and transfer to baking sheet. Brush 1/4 cup pesto over pastry within 1/2-inch of edges. Fold edges over 1/4-inch. Using fork press edges to seal. In a small bowl, combine ricotta, egg, remaining 1/4 cup parmesan cheese, salt and pepper. Spread mixture over pesto. Toss asparagus with olive oil and arrange over cheese mixture. Bake 20-25 minutes or until puff pastry is golden and asparagus are tender. Top with some of the remaining pesto and prosciutto slices. Serve remaining pesto on the side.